In October 2010, college enrollment reached 20.3 million students, up from the prior record of 19.8 million in October 2009. Among the traditional college-age population, 18- to 24-year-olds, college enrollment also reached its highest level on record at 12.2 million, up from the prior record of 12.1 million in 2009. Among 18- to 24-year-olds, the increase in college enrollment was entirely accounted for by the increase in the enrollment of young Hispanics. Since October 2009, young Hispanic enrollment increased by nearly 350,000 students, a 24% increase. As discussed below, the Latino enrollment increase cannot be entirely accounted for by population increase. The Hispanic 18- to 24-year-old population in toto increased by only 7% from 2009 to 2010. Other young minority populations also reached record levels of college enrollment in 2010, but the increases over 2009 were more modest than the Hispanic increase. Young black college enrollment increased by 88,000 students (5%). Young Asian college enrollment increased by 43,000 students since 2009 (6%). In contrast, young non-Hispanic white college enrollment decreased. 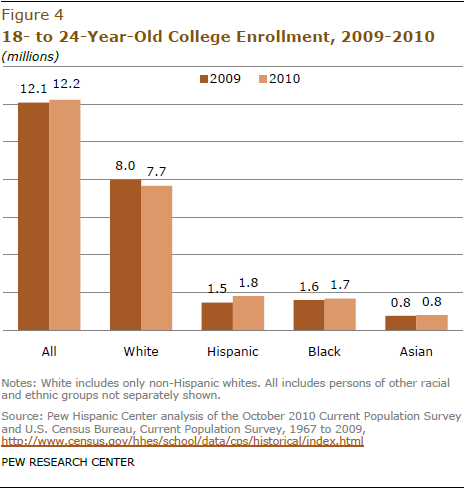 In October 2009, 18- to 24-year-old non-Hispanic white college enrollment peaked at nearly 8.0 million students. 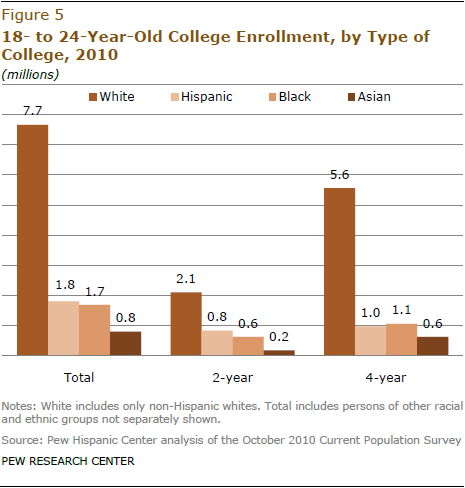 In October 2010, young non-Hispanic white college enrollment was about 7.7 million students. In 2010, young non-Hispanic white college students were only 63% of all 18- to 24-year-old college students. This is the lowest non-Hispanic white share dating back to 1993, the earliest year for which the Census Bureau publishes historical statistics on this population. Among 18- to 24-year-olds, surging Latino enrollment has resulted in Latinos becoming the largest minority group among young college students in 2010. In October 2010 there were 1.8 million Hispanic 18- to 24-year-olds enrolled in college, surpassing the 1.7 million black college students in that age group. However, Hispanics were not the largest minority population at four-year colleges and universities.4 At two-year colleges, Hispanic enrollment (0.83 million) was about 200,000 students above black enrollment (0.63 million). Hispanics becoming the nation’s largest minority among young college students was foreshadowed by high school graduation statistics. In the 2007-08 school year, the number of Hispanic public high school graduates (449,000) surpassed the number of non-Hispanic black public high school graduates (432,000) (National Center for Education Statistics, 2011b). Projections of high school graduates by race and ethnicity indicate that by 2021-22 there will be twice as many Hispanic high school graduates as non-Hispanic black high school graduates (Western Interstate Commission on Higher Education, 2008). Chapter 2 shows that the growing number of Hispanic high school graduates are part and parcel of the educational gains apparent among young Hispanics.